Since the demise of The Brickery at the end of 2015, Sandy Springs has been in mourning. The Brickery was one of those neighborhood places where everybody seemed to know each other. Where will all of those Brickery regulars go? If you live in “The Springs” and are looking for a new place visit frequently, Date Night might have found the place for you. There’s not much to say about the location, a non-descript shopping center near Roswell Road. A large outdoor dining area takes up most of the front. It’s covered (and heated) on this winter night. We sit indoors tonight. How’s this for a theme date: we go to see the movie “Brooklyn” down the street at the Lefont theater before dinner at the Brooklyn Cafe. It’s not a huge restaurant. It’s empty when we arrive, but is crowded when we depart. There’s a lot of black-clad staff working tonight. They do a great job. The bar has no taps. There’s probably not enough room. No worries as beer also comes in bottles. Having said that, here’s a problem…no beer list. When you ask for one, the server says, “well, what do you like?” and then she treats you like a neophyte while trying to guide you towards a beer you might want. We would much rather have a list and decide from that, not from recommendations. Anyway, here’s what we got. 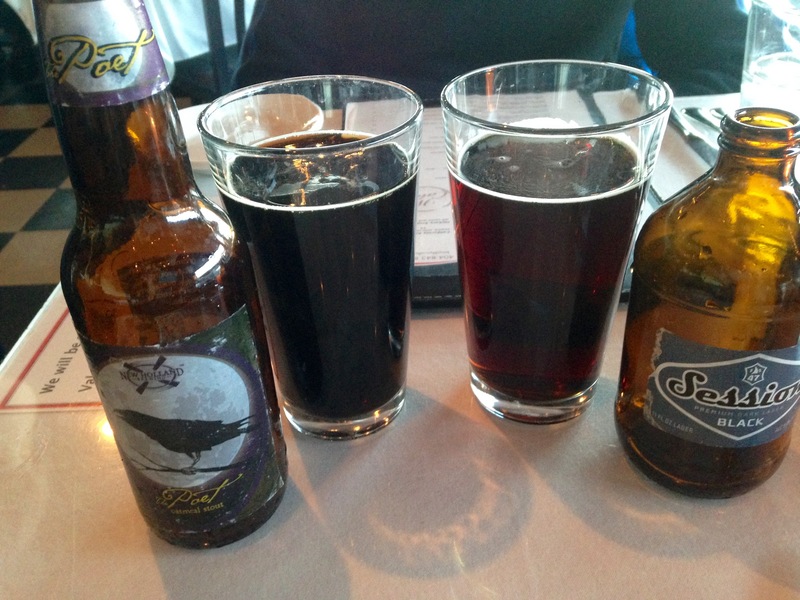 The New Holland Poet is a nice oatmeal stout that tastes a lot like the high-octane Dragon’s Milk without the bourbon. The Session is a black lager. Both are nice pours on a cold night. Did we mention we would like a beer list next time? 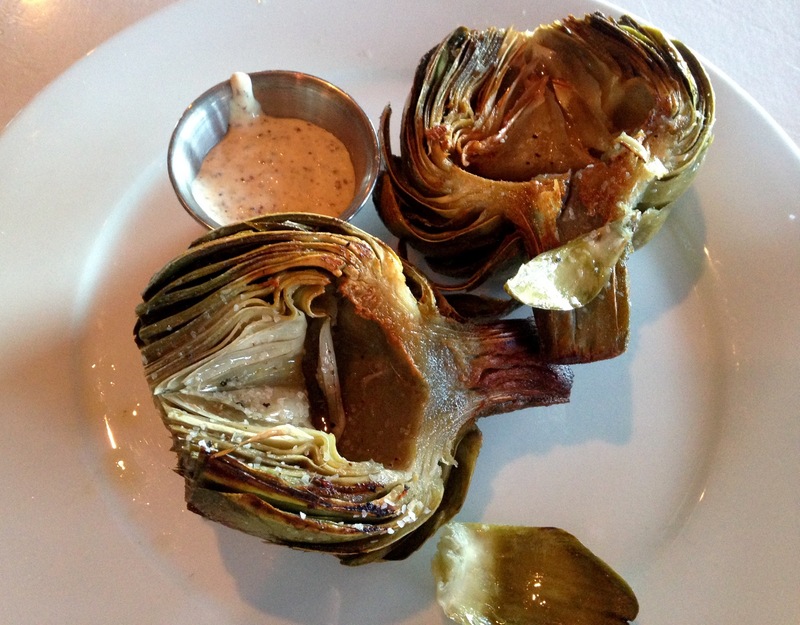 For an appetizer, we pick one of our favorite things from the left coast, a California artichoke. They do a great job on this. It’s slathered in olive oil and grilled. Split in half, it’s perfect to share with your date. It’s so good that you don’t have to dip it in the mustard sauce, but you will want to try it that way too. That mustard sauce also comes on the crab cake. Eve gets the crab cake salad. 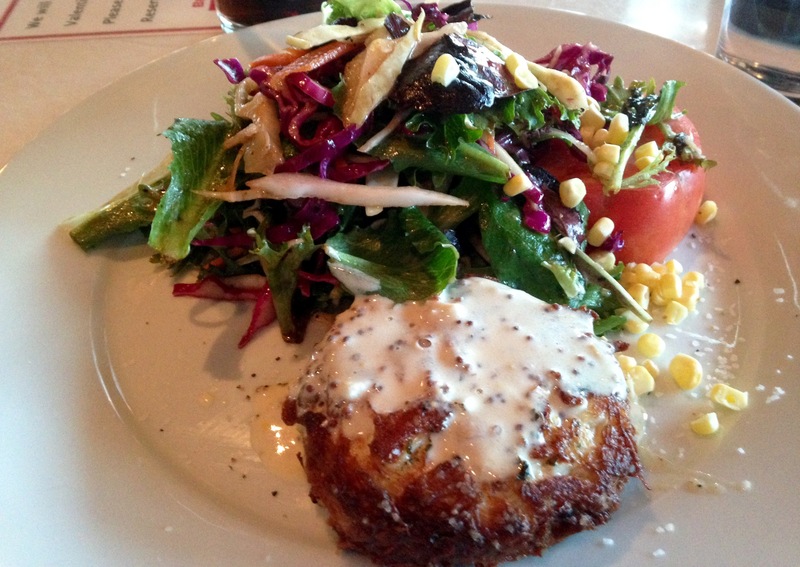 The crab cake is just that, a crab cake. No fillers, no bread crumbs, only crab meat. Combined with the salad, this dish is pleasing to the eye as well as the palate. The special for tonight is barbecue beef ribs. They had me at beef ribs. There’s a lot of meat on the two ribs. It’s cooked more like a short rib with BBQ sauce. The meat is slow-roasted and very soft. The sides are mashed taters and broccoli. Sometimes I can eat healthy. 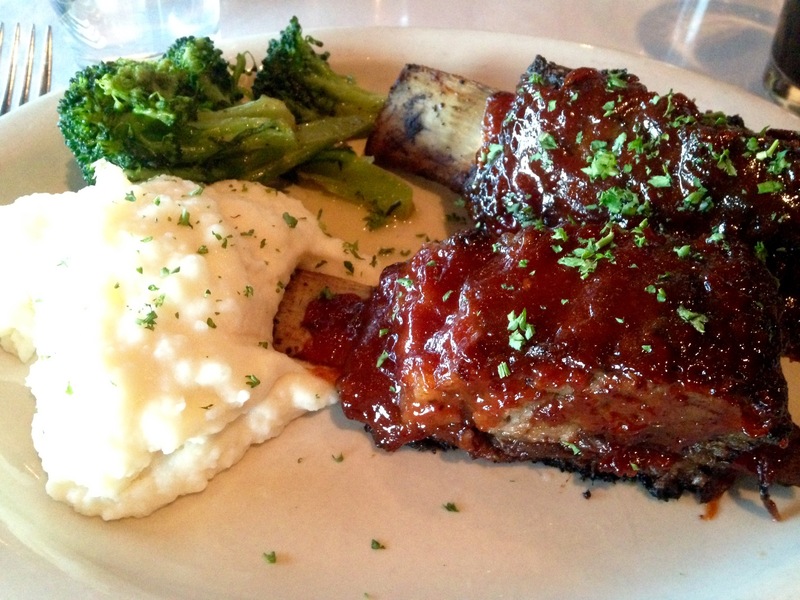 If they don’t have this as a special, there are also short ribs on the menu that probably taste a lot like these ribs. Are we too full for dessert? Yes, but sometimes you are just in the mood for chocolate. 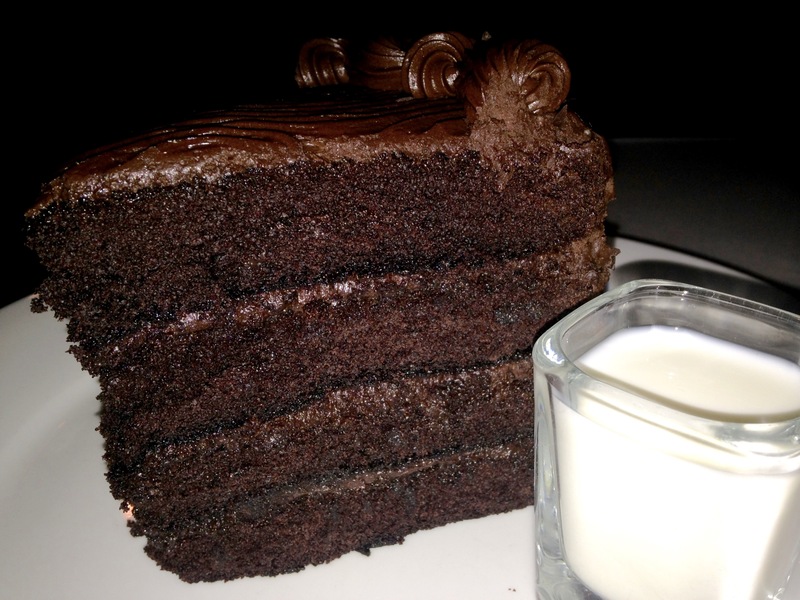 The cake is moist and full of chocolate, which is exactly what we want tonight. Here’s a nice touch–it comes with two “shots” of milk to wash it down with. This makes the cake even better. By the way, we eat about half of the cake and take the rest home for dessert the next day. 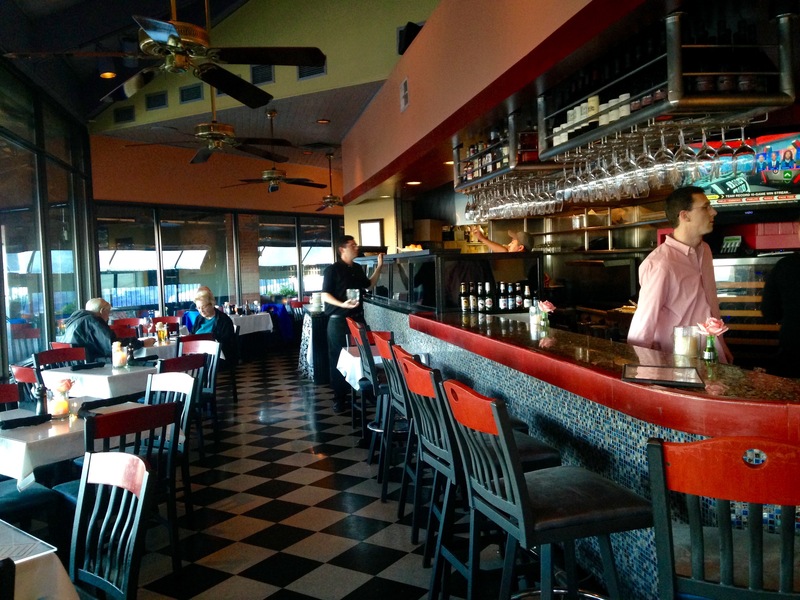 The bottom line on Brooklyn Cafe: We had a great time on our date. Our only quibble is with the beer list, which they don’t appear to have. Sure, it takes some work to maintain one, but the Brick Store has over 200 beers on their list and they don’t seem to have any trouble keeping up with their brews. I remember when Brooklyn Cafe first opened many many years ago. I had a shop in the same center and we were invited to the opening before the public. Food was outstanding then and so good to hear it still is. Not many restaurants last as long as they have. Kudos to them!